This article is about the fermented tea drink. For the Japanese drink konbu-cha, made from dried seaweed, see kelp tea. Kombucha (also tea mushroom, tea fungus, or Manchurian mushroom when referring to the culture; botanical name Medusomyces gisevii Lindau) is a fermented, slightly alcoholic, lightly effervescent, sweetened black or green tea drink commonly intended as a functional beverage for its supposed health benefits. Sometimes the beverage is called kombucha tea to distinguish it from the culture of bacteria and yeast. Juice, spices, or other flavorings are often added to enhance the taste of the beverage. The exact origins of kombucha are not known. It is thought to have originated in Northeastern China where the drink is traditionally consumed. Kombucha is also likely to have originated in Russia and Eastern Europe. Kombucha is now homebrewed globally, and also bottled and sold commercially by various companies. Kombucha is produced by fermenting sugared tea using a symbiotic culture of bacteria and yeast (SCOBY) commonly called a "mother" or "mushroom". The microbial populations in a SCOBY vary; the yeast component generally includes Saccharomyces cerevisiae, along with other species; the bacterial component almost always includes Gluconacetobacter xylinus to oxidize yeast-produced alcohols to acetic acid (and other acids). Although the SCOBY is commonly called "tea fungus" or "mushroom", it is actually "a symbiotic growth of acetic acid bacteria and osmophilic yeast species in a zoogleal mat [biofilm]". The living bacteria are said to be probiotic, one of the reasons for the drink's popularity. Numerous implausible health benefits have been attributed to drinking kombucha. These include claims for treating AIDS, aging, anorexia, arthritis, atherosclerosis, cancer, constipation, and diabetes, but there is no evidence to support any of these claims. Moreover, the beverage has caused rare cases of serious adverse effects, including fatalities, possibly arising from contamination during home preparation. Therefore, the potential harms from drinking kombucha outweigh any unclear benefits, so doctors do not recommend its use for therapeutic purposes. The exact origins of kombucha are not known, although the north-eastern region of China is commonly cited[by whom?] as a likely place of origin. It may have originated as recently as 200 years ago or as long as 2,000 years ago. The drink is reported to have been consumed in east Russia at least as early as 1900 and from there entered Europe. [need quotation to verify] Its consumption increased in the United States during the early 21st century. Having an alcohol content of less than 0.5%, kombucha is not a federally regulated beverage in the United States. Prior to 2015, some commercially-available kombucha brands were found to contain alcohol content exceeding this threshold, sparking the development of new testing methods. With rising popularity in developed countries in the early 21st century, kombucha sales increased after it was marketed[by whom?] as an alternative to beer and other alcoholic drinks in restaurants and pubs. The word kombucha is of uncertain etymology, but may be a case of a misapplied loanword from Japanese. In Japanese, the term kombucha (昆布茶, "kelp tea") refers to a completely different beverage: the kelp tea, made from dried and powdered konbu (an edible kelp from the Laminariaceae family). The term for the fermented tea in Japanese is kōcha kinoko (紅茶キノコ, "red tea mushroom"). The American Heritage Dictionary suggests that it is probably from the "Japanese kombucha, tea made from konbu (the Japanese word for kelp perhaps being used by English speakers to designate fermented tea due to confusion or because the thick gelatinous film produced by the kombucha culture was thought to resemble seaweed)." Writings about the beverage in Japanese generally take the point of view that the Japanese word 'kombucha' was mistakenly applied in English to what Japanese call "kocha kinoko." Kombucha has about 80 other names worldwide. A 1965 mycological study called kombucha "tea fungus" and listed other names: "teeschwamm, Japanese or Indonesian tea fungus, kombucha, wunderpilz, hongo, cajnij, fungus japonicus, and teekwass". Some further spellings and synonyms include combucha and tschambucco, haipao, kargasok tea, kwassan, Manchurian fungus or mushroom, spumonto, as well as the misnomers champagne of life, and chai from the sea. 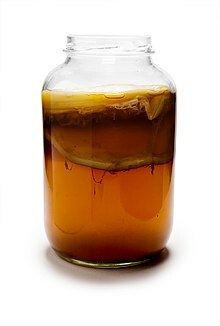 A kombucha culture is a symbiotic culture of bacteria and yeast (SCOBY), similar to mother of vinegar, containing one or more species each of bacteria and yeasts, which form a zoogleal mat known as a "mother." There is a broad spectrum of yeast species spanning several genera reported to be present in kombucha culture including species of Zygosaccharomyces, Candida, Kloeckera/Hanseniaspora, Torulaspora, Pichia, Brettanomyces/Dekkera, Saccharomyces, Lachancea, Saccharomycoides, Schizosaccharomyces, and Kluyveromyces. The mixed, presumably symbiotic culture has been further described as being lichenous, in accord with the reported presence of the known lichenous natural product usnic acid, though as of 2015, no report appears indicating the standard cyanobacterial species of lichens in association with kombucha fungal components. Kombucha is made by putting the kombucha culture into a broth of sugared tea. Kombucha tea made with less sugar may be unappealing. Sucrose is converted, biochemically, into fructose and glucose, and these into gluconic acid and acetic acid, and these substances are present in the drink. In addition, kombucha contains enzymes and amino acids, polyphenols, and various other organic acids, but the exact quantities of these items vary between preparations. Other specific components include ethanol (see below), glucuronic acid, glycerol, lactic acid, usnic acid (a hepatotoxin, see above), and B-vitamins. Kombucha has also been found to contain vitamin C.
The alcohol content of kombucha is usually less than 0.5%, but this number increases with extended fermentation times. Over-fermentation generates high amounts of acids similar to vinegar. The pH of the drink is typically about 2.5. Kombucha drink is prepared at home globally and some companies sell it commercially. Standard Kombucha production procedures include starts with boiling 1L non-chlorinated water and dissolving 50g sugar in the boiling water. Next, 5g of tea leaves are steeped in the hot sugar water for 5 minutes and then tea leaves are discarded. 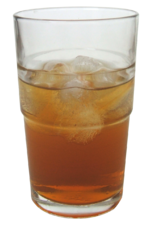 Sweetened tea is cooled to around 20°C and 24g of SCOBY culture is added. This is poured into a sterilized beaker or other glass container along with 0.2L of previously fermented kombucha tea. This will lower the pH. The container is covered with a paper towel or breathable fabric that will not allow insects such as Drosophila fruit flies to contaminate the kombucha. The tea is left to ferment for a period of up to 10 to 14 days at room temperature (18°C to 26°C). A new "daughter" SCOBY will form on the surface of the tea to the diameter of the container. After fermentation is completed, the SCOBY is removed and stored along with a small amount of the newly fermented tea. The remaining kombucha is strained and bottled for a secondary ferment for a few days or stored at a temperature of 4℃. Commercially bottled kombucha became available in the late 1990s. In 2010, elevated alcohol levels were found in many bottled kombucha products, leading retailers including Whole Foods to temporarily pull the drinks from store shelves. In response, kombucha suppliers reformulated their products to have lower alcohol levels. By 2014 US sales of bottled kombucha were $400 million, $350 million of which was earned by Millennium Products, Inc. which sells "GT's Kombucha". In 2014, the market was projected to have 30% growth, and companies that make and sell kombucha formed a trade organization, Kombucha Brewers International. In 2016, PepsiCo purchased kombucha maker KeVita for approximately $200 million. In the US, sales of kombucha and other fermented drinks rose by 37 percent in 2017. Many people drink kombucha for its purported health benefits. Research has been conducted using biological assays in vitro. Other studies have been in vivo using rats. There have not been any human trials conducted to assess its possible biological effects, and the purported health beneﬁts resulting from its biological activities have not been demonstrated in humans. In 2000, a scientific review was done, which summarized the range of claimed health benefits: "It has been claimed that Kombucha teas cure asthma, cataracts, diabetes, diarrhea, gout, herpes, insomnia and rheumatism. They are purported to shrink the prostate and expand the libido, reverse grey hair, remove wrinkles, relieve haemorrhoids, lower hypertension, prevent cancer, and promote general well-being. They are believed to stimulate the immune system, and have become popular among people who are HIV positive or have full-blown AIDS". A 2003 systematic review characterized kombucha as an "extreme example" of an unconventional remedy because of the disparity between implausible, wide-ranging health claims and the potential risks of the product. It concluded that the proposed, unsubstantiated therapeutic claims did not outweigh known risks, and that kombucha should not be recommended for therapeutic use, being in a class of "remedies that only seem to benefit those who sell them." The health benefits of kombucha are based only on animal studies and any potential benefits would need to be investigated via clinical trials. Reports of adverse effects related to kombucha consumption are rare, but may be underreported, according to the 2003 review. The American Cancer Society says that "Serious side effects and occasional deaths have been associated with drinking Kombucha tea". Because kombucha is a commonly homemade fermentation, caution should be taken because pathogenic microorganisms can contaminate the tea during preparation. Adverse effects associated with kombucha consumption include severe hepatic (liver) and renal (kidney) toxicity as well as metabolic acidosis. At least one person is known to have died after consuming kombucha, though the drink itself has never been conclusively proven as the cause of death. Some adverse health effects may arise from the acidity of the tea causing acidosis, and brewers are cautioned to avoid over-fermentation. Other adverse effects may be a result of bacterial or fungal contamination during the brewing process. Some studies have found the hepatotoxin usnic acid in kombucha, although it is not known whether the cases of liver damage are due to usnic acid or to some other toxin. Topical use of the tea was associated with anthrax infection in one report, but contamination of the tea may have occurred during storage. Drinking kombucha can be harmful for people with preexisting ailments. Due to its microbial sourcing and possible non-sterile packaging, kombucha is not recommended for people with poor immune function, women who are pregnant or nursing, or children under 4 years old. It may compromise immune responses or stomach acidity in these susceptible populations. There are certain drugs that you should not take at the same time as kombucha because of the small percentage of alcohol content. A systematic review of 2019 confirmed the numerous health risks but said "kombucha is not considered harmful if about 4 oz per day is consumed by healthy individuals; potential risks are associated with a low pH brew leaching heavy metals from containers, excessive consumption of highly acidic kombucha, or consumption by individuals with pre-existing health conditions." Kombucha culture, when dried, becomes a leather-like textile known as a microbial cellulose that can be molded onto forms to create seamless clothing. Using different broth media such as coffee, black tea, and green tea to grow the kombucha culture results in different textile colors, although the textile can also be dyed using plant-based dyes. Different growth media and dyes also change the textile's feel and texture. ^ a b c d e f g h i Jayabalan, Rasu (21 June 2014). "A Review on Kombucha Tea—Microbiology, Composition, Fermentation, Beneficial Effects, Toxicity, and Tea Fungus". Comprehensive Reviews in Food Science and Food Safety. 13 (4): 538–550. doi:10.1111/1541-4337.12073. ^ "A mug of kombucha for your health?". Mayo Clinic. Retrieved 2018-09-01. ^ a b The Oxford Companion to Sugar and Sweets. Oxford University Press. 1 April 2015. pp. 720–. ISBN 978-0-19-931362-4. ^ Troitino, Christina. "Kombucha 101: Demystifying The Past, Present And Future Of The Fermented Tea Drink". Forbes. Retrieved 2017-04-10. ^ a b Jarrell J, Cal T, Bennett JW (2000). "The Kombucha Consortia of yeasts and bacteria". Mycologist. 14 (4): 166–170. doi:10.1016/S0269-915X(00)80034-8. ^ a b c Bauer, Brent (July 8, 2017). "What is kombucha tea? Does it have any health benefits?". Mayo Clinic. Retrieved 2018-09-05. ^ a b c d e f g h Ernst E (2003). "Kombucha: a systematic review of the clinical evidence". Forschende Komplementärmedizin und Klassische Naturheilkunde. 10 (2): 85–87. doi:10.1159/000071667. PMID 12808367. ^ "Kombucha". www.mskcc.org. Memorial Sloan Kettering Cancer Center. 22 May 2014. Retrieved 2017-04-10. ^ a b Hamblin, James (8 December 2016). "Is Fermented Tea Making People Feel Enlightened Because of ... Alcohol?". The Atlantic. Retrieved 26 November 2017. ^ a b Sreeramulu, G; Zhu, Y; Knol, W (2000). "Kombucha fermentation and its antimicrobial activity". Journal of Agricultural and Food Chemistry. 48 (6): 2589–94. doi:10.1021/jf991333m. PMID 10888589. ^ Sandor Ellix Katz (2012). The Art of Fermentation: An In-depth Exploration of Essential Concepts and Processes from Around the World. Chelsea Green Publishing. pp. 167–. ISBN 978-1-60358-286-5. ^ Wyatt, Kristen (12 October 2015). "As kombucha sales boom, makers ask feds for new alcohol test". Associated Press. Retrieved 26 November 2017. ^ a b Fleming, Amy (2018-10-11). "Kombucha: can the fermented drink compete with beer at the bar?". The Guardian. Retrieved 2018-10-11. ^ Algeo, John; Algeo, Adele (1997). "Among the New Words". American Speech. 72 (2): 183–97. doi:10.2307/455789. JSTOR 455789. ^ Wong, Crystal (12 July 2007). "U.S. 'kombucha': Smelly and No Kelp". Japan Times. Retrieved 14 June 2015. .
^ "Kombucha". American Heritage Dictionary (Fifth ed.). Houghton Mifflin Harcourt Publishing Company. 2015. Retrieved 27 June 2015. ^ O'Neill, Molly (28 December 1994). "A Magic Mushroom Or a Toxic Fad?". New York Times. Retrieved 14 June 2015. ^ Hesseltine, C. W. (1965). "A Millennium of Fungi, Food, and Fermentation". Mycologia. 57 (2): 149–97. doi:10.2307/3756821. JSTOR 3756821. PMID 14261924. ^ a b c d "Kombucha". Memorial Sloan Kettering Cancer Center. 22 May 2014. Retrieved 1 June 2015. ^ Blanc, Phillipe J (February 1996). "Characterization of the tea fungus metabolites". Biotechnology Letters. 18 (2): 139–142. doi:10.1007/BF00128667. ^ Villarreal‐Soto, Silvia Alejandra; Beaufort, Sandra; Bouajila, Jalloul; Souchard, Jean-Pierre; Taillandier, Patricia (2018). "Understanding Kombucha Tea Fermentation: A Review". Journal of Food Science. 83 (3): 580–588. doi:10.1111/1750-3841.14068. ISSN 1750-3841. PMID 29508944. ^ Sarkar, Dayanidhi; Yabusaki, Masahiro; Hasebe, Yuta; Ho, Pei Yee; Kohmoto, Shuji; Kaga, Takayuki; Shimizu, Kazuyuki (2010). 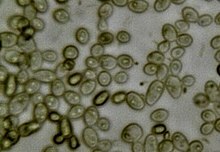 "Fermentation and metabolic characteristics of Gluconacetobacter oboediens for different carbon sources". Applied Microbiology and Biotechnology. 87 (1): 127–136. doi:10.1007/s00253-010-2474-x. PMID 20191270. ^ Nguyen, VT; Flanagan, B; Gidley, MJ; Dykes, GA (2008). "Characterization of cellulose production by a gluconacetobacter xylinus strain from kombucha". Current Microbiology. 57 (5): 449–53. doi:10.1007/s00284-008-9228-3. PMID 18704575. ^ a b "Drug record, Usnic acid (Usnea species)". LiverTox. National Library of Medicine, National Institutes of Health. 23 June 2015. Retrieved 26 July 2017. ^ Hannah Crum; Alex LaGory (2016). The Big Book of Kombucha: Brewing, Flavoring, and Enjoying the Benefits of Fermented Tea. Storey Publishing, LLC. pp. 69–. ISBN 978-1-61212-433-9. ^ Teoh, AL; Heard, G; Cox, J (2004). "Yeast ecology of kombucha fermentation". International Journal of Food Microbiology. 95 (2): 119–26. doi:10.1016/j.ijfoodmicro.2003.12.020. PMID 15282124. ^ Dufresne, C; Farnworth, E (2000). "Tea, kombucha, and health: A review". Food Research International. 33 (6): 409–421. doi:10.1016/S0963-9969(00)00067-3. ^ Velicanski, A; Cvetkovic, D; Markov, S; Tumbas, V; et al. (2007). "Antimicrobial and antioxidant activity of lemon balm Kombucha". Acta Periodica Technologica (38): 165–72. doi:10.2298/APT0738165V. ^ Bauer-Petrovska, B; Petrushevska-Tozi, L (2000). "Mineral and water soluble vitamin content in the kombucha drink". International Journal of Food Science & Technology. 35 (2): 201–5. doi:10.1046/j.1365-2621.2000.00342.x. ^ a b c d Food Safety Assessment of Kombucha Tea Recipe and Food Safety Plan (PDF) (Report). Food Issue, Notes From the Field. British Columbia (BC) Centre for Disease Control. 27 January 2015. Retrieved 1 July 2015. ^ Jayabalan, Rasu; Malbaša, Radomir V.; Lončar, Eva S.; Vitas, Jasmina S.; Sathishkumar, Muthuswamy (2014-06-21). "A Review on Kombucha Tea-Microbiology, Composition, Fermentation, Beneficial Effects, Toxicity, and Tea Fungus". Comprehensive Reviews in Food Science and Food Safety. 13 (4): 538–550. doi:10.1111/1541-4337.12073. ISSN 1541-4337. ^ Wollan, Malia (24 March 2010). "A Strange Brew May Be a Good Thing". NYTimes. Retrieved 18 June 2015. ^ Rothman, Max (2 May 2013). "'Kombucha Crisis' Fuels Progress". BevNET. Retrieved 18 June 2015. ^ Crum, Hannah (23 August 2011). "The Kombucha Crisis: One Year Later". BevNET. Retrieved 27 June 2015. ^ Narula, Svati Kirsten (26 March 2015). "The American kombucha craze, in one home-brewed chart". Quartz. Retrieved 27 June 2015. ^ Carr, Coeli (9 August 2014). "Kombucha cha-ching: A probiotic tea fizzes up strong growth". CNBC. Retrieved 27 June 2015. ^ Esterl, Mike (23 November 2016). "Slow Start for Soda Industry's Push to Cut Calories". Wall Street Journal. Retrieved 24 November 2016. ^ a b c Villarreal-Soto, Silvia Alejandra; Beaufort, Sandra; Bouajila, Jalloul; Souchard, Jean-Pierre; Taillandier, Patricia (2018). "Understanding Kombucha Tea Fermentation: A Review". Journal of Food Science. 83 (3): 580–588. doi:10.1111/1750-3841.14068. ISSN 0022-1147. PMID 29508944. ^ a b Kapp JM, Sumner W (February 2019). "Kombucha: a systematic review of the empirical evidence of human health benefit". Ann Epidemiol. 30: 66–70. doi:10.1016/j.annepidem.2018.11.001. PMID 30527803. ^ Dasgupta, Amitava (2011). Effects of Herbal Supplements on Clinical Laboratory Test Results. Berlin, Germany: Walter de Gruyter. pp. 24, 108, 112. ISBN 978-3-1102-4561-5. ^ a b Dasgupta, Amitava (2013). "Effects of herbal remedies on clinical laboratory tests". In Dasgupta, Amitava; Sepulveda, Jorge L. (eds.). Accurate Results in the Clinical Laboratory: A Guide to Error Detection and Correction. Amsterdam, NH: Elsevier. pp. 78–79. ISBN 978-0-1241-5783-5. ^ Abdualmjid, Reem J; Sergi, Consolato (2013). "Hepatotoxic Botanicals—An Evidence-based Systematic Review". Journal of Pharmacy & Pharmaceutical Sciences. 16 (3): 376–404. doi:10.18433/J36G6X. PMID 24021288. ^ Bryant BJ, Knights KM (2011). Chapter 3: Over-the-counter Drugs and Complementary Therapies. Pharmacology for Health Professionals (3rd ed.). Elsevier Australia. p. 78. ISBN 978-0-7295-3929-6. Kombucha has been associated with illnesses and death. A tea made from Kombucha is said to be a tonic, but several people have been hospitalised and at least one woman died after taking this product. The cause could not be directly linked to Kombucha. Several theories were offered, e.g. The tea might have reacted with other medications that the woman was taking, or bacteria might grow in the Kombucha liquid and, in patients with suppressed immunity, might prove to be fatal. ^ Unexplained Severe Illness Possibly Associated with Consumption of Kombucha Tea -- Iowa, 1995 (Report). Morbidity and Mortality Weekly Report. 44. CDC. 8 December 1995. pp. 892–893, 899–900. Retrieved 18 July 2015. ^ Nummer, Brian A. (November 2013). "Kombucha Brewing Under the Food and Drug Administration Model Food Code: Risk Analysis and Processing Guidance". Journal of Environmental Health. 76 (4): 8–11. PMID 24341155. ^ Greenwalt, C. J.; Steinkraus, K. H.; Ledford, R. A. (2000). "Kombucha, the Fermented Tea: Microbiology, Composition, and Claimed Health Effects". Journal of Food Protection. 63 (7): 976–981. doi:10.4315/0362-028X-63.7.976. ISSN 0362-028X. PMID 10914673. ^ Martini, Nataly (March 2018). "Potion or Poison? Kombucha". Journal of Primary Health Care. 10 (1): 13. ^ Grushkin, Daniel (17 February 2015). "Meet the Woman Who Wants to Grow Clothing in a Lab". Popular Science. Retrieved 18 June 2015. ^ Oiljala, Leena (9 September 2014). "BIOCOUTURE Creates Kombucha Mushroom Fabric For Fashion & Architecture". Pratt Institute. Archived from the original on 19 June 2015. Retrieved 18 June 2015. ^ a b Hinchliffe, Jessica (25 September 2014). "'Scary and gross': Queensland fashion students grow garments in jars with kombucha". ABCNet.net.au. Retrieved 18 June 2015. Wikimedia Commons has media related to Kombucha.